I still love doing the EDM Challenges 3+ years after joining. They always take me out of my comfort zone in some way, and at least give me a fun project for one of my daily sketches each week. We were away during challenge #212, which somehow always means that I fall further behind. But now I can post the last three weeks and begin anew. My very uninteresting microwave. Our kids think we were the last family in town to buy one when they were growing up and this was recently passed on to us by one of them when our last one died. I started quilting when we lived in San Antonio, TX almost 30 years ago. There was a resurgence of interest in quilting right after the US bicentential, and I was working full time, had 3 small children, and loved to make things. I always worked with fabric, so it was the perfect "new passion" for me - allowing me to carry around small pieces of a big project and make otherwise boring soccer practices, swim meets, or car pool waiting more enjoyable. They loved the quilts and pillows that I made for them and now I'm making them for their children. 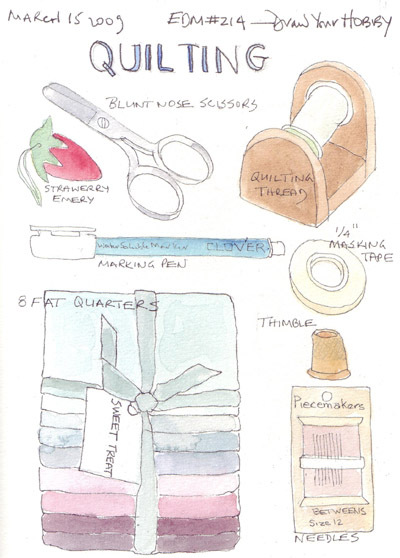 These are the tools in my basket as I hand quilt (belatedly) a wedding quilt for one of my sons. We just returned from a short trip to Washington, DC - part business and part pleasure. 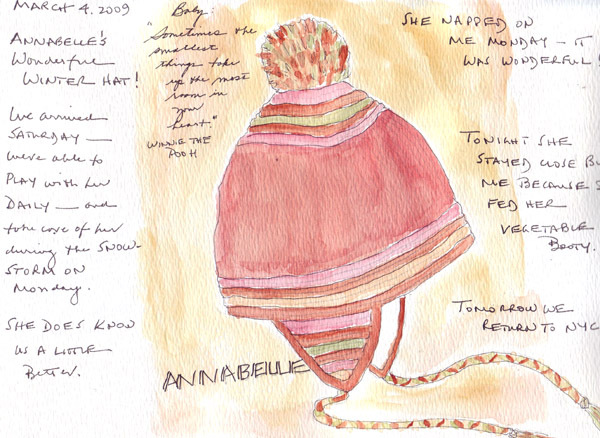 Our youngest grandchild lives there and I have a dedicated sketchbook to use each day that we are with her. Annabelle will be one at the end of this month - and we don't see enough of her! Saturday afternoon we went to the new Capitol Visitor's Center to see the space. We didn't have time to look at Exhibition Hall, but the main area is wonderful! There are many statues, but the cast of the Statue of Freedom which sits on top of the Capitol Dome is the most important one. Here is her head - and an eagle logo found on many of the items in the Gift Shop. Annabelle pulls herself up on everything and is cruising an entire room very quickly. 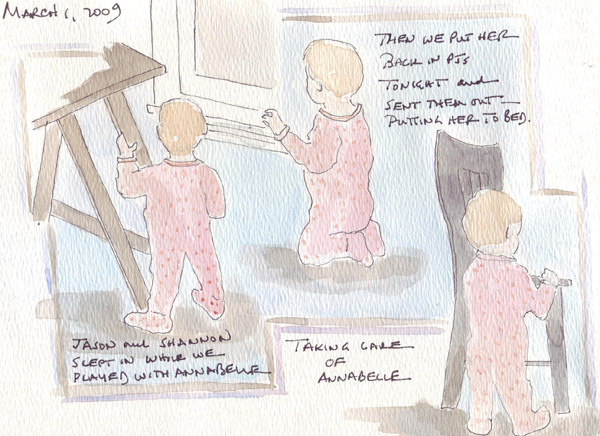 These are quick sketches of her in her PJs. There was alot of snow when we woke up on Monday morning. We kept Annabelle home from Day Care to play with us while my son and daughter-in-law went to work. She loves playing with the Noah's Ark and animals that she received as an early birthday present, so it was immortalized on this page. 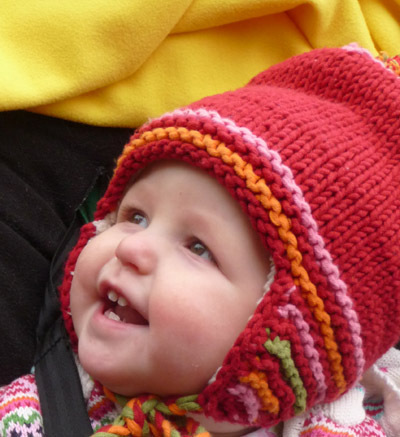 We all love her really warm winter hat and she looks really cute in it. We're sad that it probably won't fit her next winter. I am still inspired by the India photos from my friend Bunny's recent trip to India. 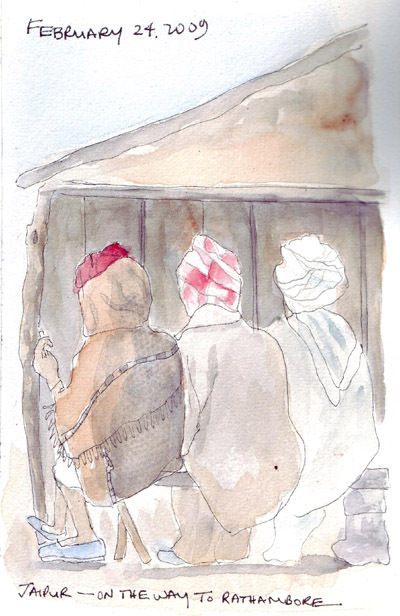 This is a photo from the bus of 3 men sitting on a bench in Jaipur, in front of an open side building. Today I had 5 minutes to sketch between my haircut and picking up our grandson at Nursery School. 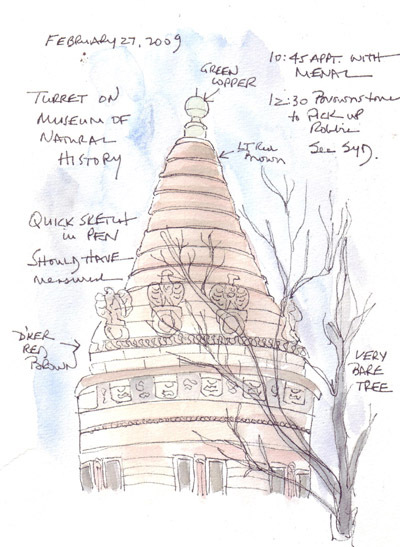 I sat on the base of a wall, in the sun, and sketched a turret on the Southwestern corner of the Natural History Museum - using pen with a watercolor wash. It is really fast and really, really loose. 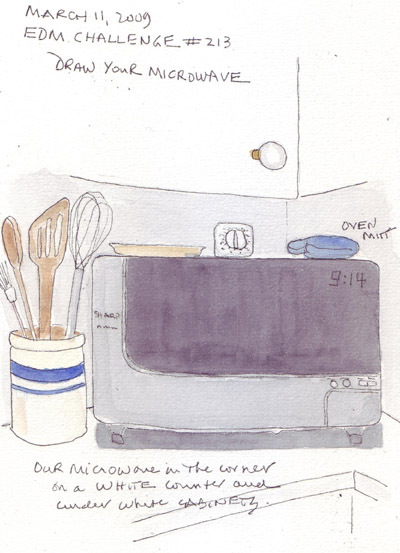 I sometimes feel as if I have sketched everything in this apartment at one time or another. 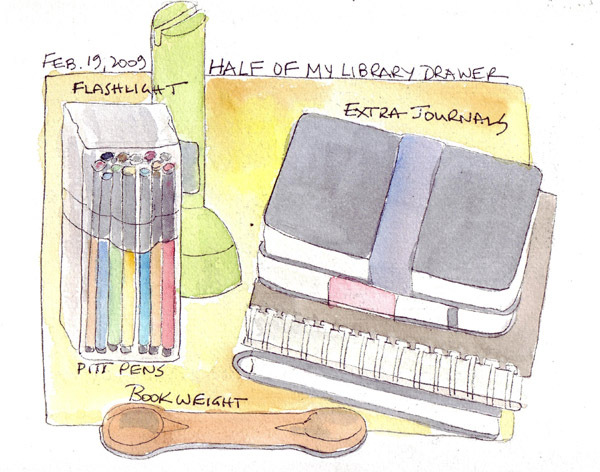 After a full day at work, when too tired to look further, I sketched a few items from the drawer that I use, right next to my end of the couch in our library. My daughter bought an amazing light fixture for her children's playroom several years ago and it is a constant challenge for me to draw one of the objects suspended from the structure. 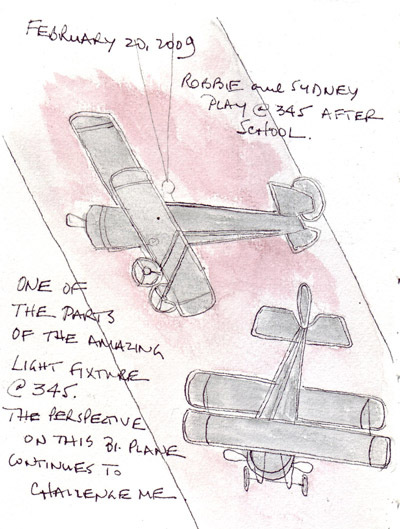 I was with two of my grandchildren last week when I decided to try to sketch the biplane yet another time. I am looking up at the plane and can never convince myself that I can tell which wing is on top and which is on the bottom. We had a full day of family activities last Saturday. In the morning we had a brunch to celebrate our youngest grandchild's first birthday - several weeks early because none of us would be in DC on her actual birthday. In the evening, my husband and I and our 3 children and their spousese took my mother out for dinner in Manhattan for her 90th birthday. 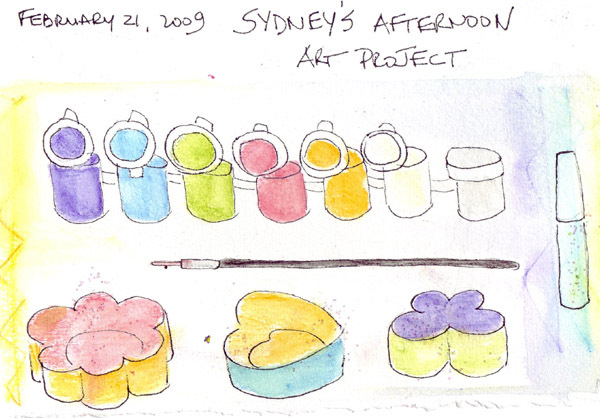 In the afternoon, while the youngest children took naps, 4 year old Sydney spent two hours on an art project and while she was busy painting and decorating little jewelry boxes, I sketched her supplies. She had glitter glue (the tube on the far left) and used her finger to add it to my journal page. All of those dirty little dots are really sparkling! I'm constantly torn between practicing some art skills and keeping a visual journal. So far I've divided my daily sketchbook pages between the two, but it is a constant mental struggle. 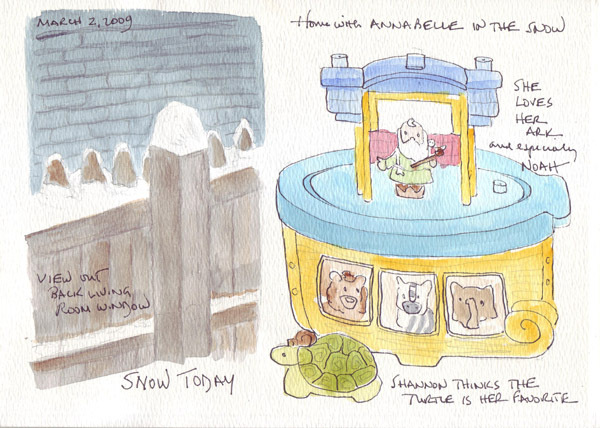 One of my goals for 2009 is to continue to sketch/paint at least one face and figure each week. I was delighted when my friend shared all of her photos from a recent trip to India and I'm having a wonderful using them for inspiration. 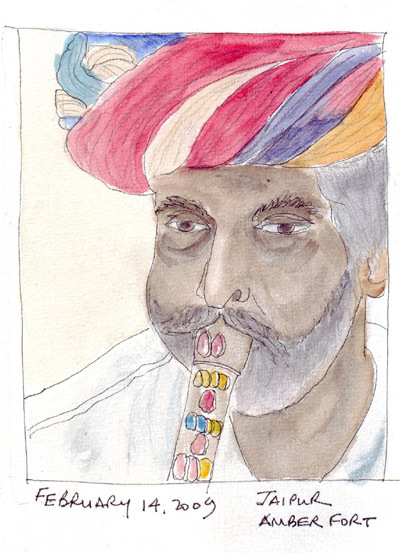 I think this might be a snake charmer - at Amber Fort - but there is no photo of a basket and snake. 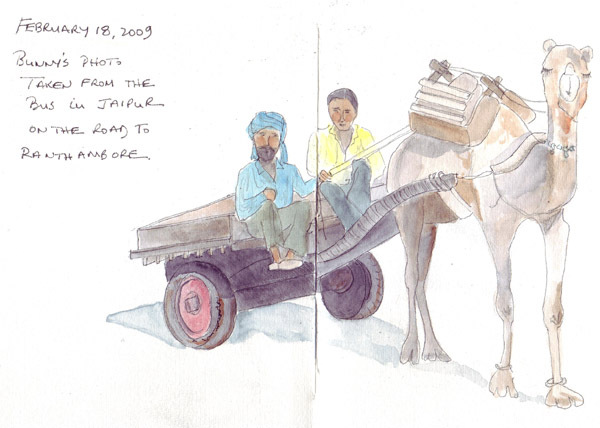 This is one of several camel carts in a procession in Jaipur on the road to Ranthambore. The photo was taken from a bus window as they passed. I'm not sure that I have sketched a camel before and couldn't wait until I found a photo taken at just the right angle. 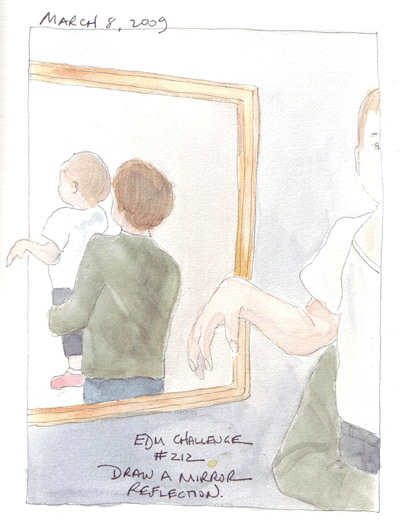 This was painted across two pages. As always, thank you Bunny for your wonderful collection of photos. 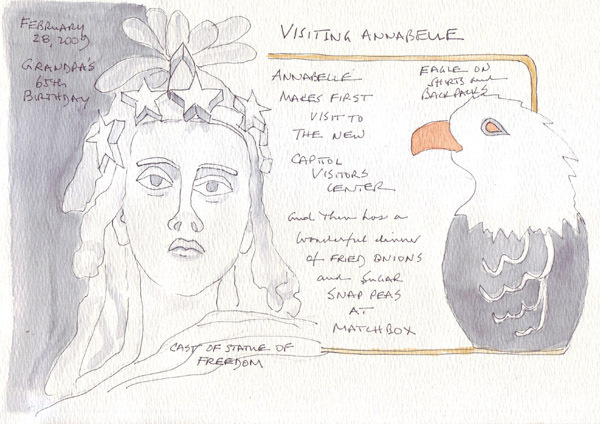 The wonderful animal photos from the National Park can even be another series of practice drawings.